Accommodation during trek in tea houses. Accomodation first and last day in 3-star hotel at Kathmandu. In the highest altitude all the imaginary thoughts will wipe out for sure cause at the Everest Base camp is a lethal journey on hills and come back alive is an achievement itself. At a point, it started feeling like blue bed sheet is there with white embroidery by snow flexes. You’ll get 5 Charming views of the Alpine lake on the way, world’s heights peak is not just a thing to hike it needs courage and a perfect trek leader. Come on guys you can do it, it’s just the last few brave steps to the summit”, you’ll get voice with a roar from trek leader and guide a man of excellent persona and an amazing confidence and knowledge about the work he is supposedly hired for. It was his passionate encouragement that made the trip successful and trusts us without him being there most of us would have missed out on the core of the beauty of the nature which needs eyes of an admirer to appreciate and the rest of us would never be able to make it to the top. We know this must sound like a mountaineering expedition to the Everest but fortunately. This is about the most beautiful places you have ever been to and it’ll be your most memorable trip ever: - Everest Base Camp. This trek will Inspire your inner peace to love for traveling and exploring the places less known, frantically searched will stop for a trekking camp which was just the thing and here you get neither too mainstream nor too out of the box. A vacation to a suburb is something that attracts you the most and sure the trekkers too, the most. The cool breeze, the bright sun which seems so pleasant in the chilliness of the area and of course the scenic landscape the place offers to the eyes which are already too tired with the hypocrisy of the world. There always comes a point where we want to travel to a place which is neither too far from our residence yet far enough to give our souls a break. Amongst the many places that we can choose from Everest Base Camp (it lies in NEPAL, don’t even need much hustle to get there) is one of the highly recommended places that one must visit once in their lifetime. Situated at a height of 17,600 Ft. amongst the innumerable places that the Himalayas have offered to us to visit this is one of the yet unexplored places and it’s a treat and delight to yourself to be able to do this trek while you are still young and energetic. You shall be received by our representatives at the airport from where you will be taken to your hotel and made to check in your respective rooms. The rest of the day is left for you to be one with the place and prepare yourself mentally and physically. Some of the eager tourists might not want to miss out on the Thames Street which is a local hub of multi-cuisine restaurants, casinos, and shops from where trekking gears can be purchased. A nearby tourist spot is the Darbar Marg. The next morning we trek for another 5-6 hrs on an inclining path to the yet beautiful suburb called Namche Bazaar at 3440 m of height. The route passes through a range of green lush mountains just like described by various poets in their odes. We stop at the place called Monjo which will be the last place where you get food till the next stop, Namche. The path is a bit tougher than you have traversed yet. To add to the beauty of the place and personifying life in its extremest way is the Dudh Koshi River that flows all the way long to Namche. An unclear view of Everest and Lhotse peaks is possible just before we step into Namche and let you rest in your hotel for the night. We are not going to be harsh on you so you guys have the day to yourselves to enjoy a mini New York, i.e. our Namche Bazaar and make yourself comfortable with not only the altitude of the place but also with a rich heritage of the place. Coffee shops, cafes all are a treat here and to add to the knowledge of our tourist who loves knowing about the place we have the Namche museum another 20 min trek from the main market, also u can get the clear view of the Everest and Lhotse ranges that remained unaccomplished the day before. Enjoy well the next day got to get you going! A small valley situated at 3860 m, this is going to be the highlights of the trek through this 5 hrs long moderately difficult trek is going to exhaust you but the result is going to be totally rewarding. Also the local monastery there is worth a visit and to get in sync with the inner self! The trek today is going to cover a lot of places, starting with Pangboche village where we are likely to halt for lunch. Post worshipping the stomach lets worship the job we are here to do, passing through Pheriche we reach the Imja Valley which cradles the Lobuche river which nourishes the life that sustains on its banks. You get an amazing opportunity to cross the river and start an inclining trek to the destination Dingboche. The trek is going to last for an exhausting 6-7 hrs, be prepared. After being quite harsh (though it’s our job) we still care for our guests as our God! We will help you take a small hike to get a mesmerizing view of the 3 beautiful peaks Mt. Lhotse, Mt. Makalu, Mt. Cho Yu plus plenty of another peak also allow you to do sightseeing at the place and enjoy yourselves and prepare for the fun that still awaits you! Today we trek to Dughia first were on the way you can enjoy the scenic mountains and the river flowing through them just as Bollywood has always portrayed to us in the YashRajFilms. Do not miss to catch a glimpse of Mt. Pumori, Mt. Nuptse and Mt. Cholatse and Thamserku(PS:- All of them look literally the same but they have got distinct identities). Once we cross the Khumbu glacier, you see another set of mountain peaks namely Mt. Khumbulse, Mt. Lingtren, and Mt. Mahalangur which all are near to the Everest which itself ain't visible from here. This 5-7 hrs trek along the glacier route will lead to you to the Everest base camp from where although the peak won’t be visible but the feeling to be at the base of the worlds highest peak itself is an accomplishment. We will not leave you disappointed, we will show the peak tomorrow from Kala Patthar. Time to get back to Gorakshep for the night, calm the butterflies till tomorrow. Yay guys! You have made it to the most amazing part of the trek. This is going to be the most difficult part of your journey but there is no gain without the pain. You see THE MOUNT EVEREST from Kala Patthar and this is going to be the breathtaking moments in your lives the one that you will cherish all your lives. Enough of capturing the moment, time to get back to Pheriche. It’s a declining trek of 5-6 hrs, but be careful, do not slip! We are now taking you back to Namche. Going to be 6-7 hrs declining trek. It’s the way back to Lukla on a 6-7 hrs declining trek. Only a single patch of incline on the way. You shall be dropped to the airport by our staff to be able to catch the flight back home on time. Trekking on Everest Base Camp is a different kind of adventure where you required to be physically and mentally prepared for the best and worse, at the same time. While high altitudes treks making it tough to breathe, the beauty of those pristine mountains leaves you speechless so that you forget to breathe for a moment or two. In addition to the physical and mental preparation, there is a certain aspect of the health that is needed to be considered on the first hand when you make up your mind about the trekking at Everest Base Camp. Trekking at Everest Base Camp pass demands endurance and fitness and those who suffer any kind of physical or physiological ailments are advised not to go for high altitude treks in the beginning. To get assurance about the trekker’s fitness, we comply with certain aspects of the being fit such as BMI (Body Mass Index) along with the fitness proof since we can’t put the trekkers into the risk. Trekveda provides you all the necessary equipment for trekking at Everest Base Camp Trek from tents to ropes. In addition to that, our trek leaders also ensure the safety by various safeguards they take from time to time for your safety. Microspikes are provided to attach to your shoes which help you to keep the traction on the snow and make it easier to climb. An additional gaiter is provided to cover the snows which prevent the entering of snow into the shoes. Customized tents are provided to the trekkers which ensure the warmth and temperature 10 degrees higher than the outside coupled up with high-quality sleeping bags which can endure the temperature up to 15 degree Celsius below the freezing point. 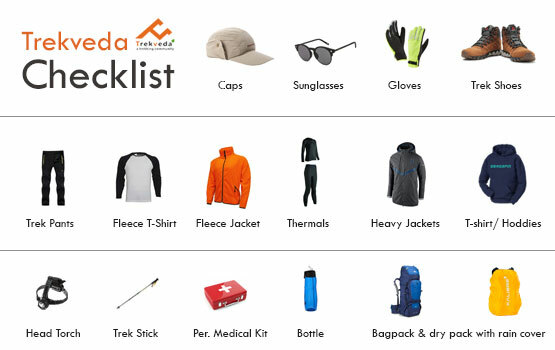 Trekveda, keep all your nutritional and hydration requirements on its checklist, our trek leaders will guide you to keep your body hydrated on the high altitudes Everest base camp as de-hydration can attract to the severe medical emergencies while trekking. Everest Base Camp trek is a difficult trek which is suitable for experts. Who have at least physical and mental conditioning for doing the difficult trek. Trekking at Everest Base Camp trek, for its ever-lasting memories and experience, demands just a few things which involve physical endurance with physiological wellness. Not just the one who’s physically fit would do the magic in trekking but one also needs to be mentally fit as well in order to cope up with the adversities one might have to face during the treks such natural calamities, rains or other unforeseen conditions. Getting to the Everest Base Camp trek without proper preparation is something you should never do. Cardiovascular exercise is one of the most sought-after methods which provides not just the physical endurance but also the strength to withstand any unavoidable circumstances sternly. Trekking at Everest Base Camp trek demands the high endurance which you can develop in few months depending upon your physical condition, where you need to begin with the jogging or running (only if you could do). This practice needs to be combined with the speed and distance targets. You need to keep on increasing both with the time. The trek expense of Rs. 59,650 + 5% GST takes care of all expenses of the trek from Kathmandu to Kathmandu. Accommodation – Stay is included from Day 1 to the last day of the trek. You will be staying in the 3-star hotel of the respective locations & Tea houses on remaining days of the trek. Meals – All meals from Day 1 to breakfast till last day of the trek are included. We provide simple, nutritious vegetarian food (Breakfast, Lunch, Dinner, Coffee/Tea) on all days of the trek. Trekking Permit Charges – All trekking permits and forest camping charges are included (National Park Permit, TIMS). Airport Pickup From International Terminal. Domestic Flights – Kathmandu to Lukla to Kathmandu. Domestic Airport Transfers – Transportation from Base camp (Hotel) to Domestic Airport and back to Base Camp (Hotel). lunch and Dinner in hotel. Backpack offloading charges - If you wish to offload your backpack, there will be an additional charge of Rs. 12,000 + 5% GST. The backpack cannot weigh more than 9 kgs.Please note that charges will vary for last minute offloading in case you decide to offload your bag after reaching the basecamp (Rs. 12,000 per day inclusive of tax). Online offloading in advance is possible up to two days prior to the trek start date. Buffer day – It is mandatory to have this extra day as any bad weather or rain will delay your pass crossing. If buffer day is utilized, you will need to pay Rs. 4,600 + 5% GST. This amount is to be handed over to your trek leader. What is the average Everest Base Camp temperature is? The temperature of Everest Base Camp trek in winters remains -10°C at Base camp. How many days Everest Base Camptrek will take? The Basically it’s a 14 day trek which is followed by tour guide but due to any emergencies like heavy rain or snow fall we’ll shuffle the days accordingly. Why Everest Base Camp trek is famous? Everest Base Camp offers the gorgeous snow hurdles and gigantic hill which this trek is famous, with stunning meadows and streams lining the trail will surprise you with its beauty. What is the height of Everest Base CampTrek? The Everest Base Campheight varies with every phase you pass as your approach the Everest Base Camptrek, you will acclaim a height of around 17,600 mt. What will be the base camp of Everest Base Camptrek? Trekveda makes its basecamp at Lukla. This is one of the most beautiful places that leads to you to the pristine areas while letting your relish the vibrancy of nature. How do we reach Kathmandu? No, you can’t take your child on Everest Base Camp trek, cause the difficulty level is a bit high for kids. The best season to see the snow on Everest Base Camp trek has 2 season pre and post- monsoon. 1st is starts form February to May and 2nd will be in late September to December. Where you can see a lot of snow-clad you can also witness the fresh snowfall at heights if the climate is favorable but if you’re planning to see the snow at large then the Last week of September and first week of December is best. Yes! Nepalese telecommunications company, Ncell is providing accessible internet & mobile network on this trek will accesses able till camp. Everest Base Camp trek is considered as Moderate to very difficult trek which can be done by anyone, who is fit to trek. Your basecamp Lukla will be your starting point and ending point will be same. You will get this detail while booking of every trek respectively. Yes, there is no acclimatization day on this trek. Returning to the home with the mystical memories would probably be the best feeling after the trek. Your Trek will end at Kathmandu in our guest house, to return you will take a cab from Kathmandu and then same way you reach there. Yes, this is teahouse base trek so you can fill your bottles on guesthouse or rest water source is natural streams, rivers and water springs in the mountains and it is safe to drink. The total expenses of the trek will be …….. INR per person. In addition to that an additional of 5 per cent of the GST will be levied on the total cost.